Over the last week or so we have been randomly seeing a 5 star rating box in Google search results performed on mobile devices. To be specific this rating has been displaying in Safari while logged out. I have yet to see this in Chrome / incognito / logged in (although it could very well be showing up for others in other browsers or while logged in). It is fairly safe to assume that Google released these about the same time that they announced mobile friendly labels into search on November 18, 2014. What will they use this feedback for? Will it affect rankings? No, probably not. I am guessing they are simply trying to test the accuracy of the mobile-friendly labels. Although, I personally think that in the near future it would make sense to push down sites that are not mobile friendly, at least in mobile search. Pages that are not mobile friendly create a, in Google’s words, frustrating user experience; that is quite the opposite of what Google wishes to deliver to their users. To me it is obvious that pages which are not mobile-friendly will eventually practically vanish from the front page of mobile search results. 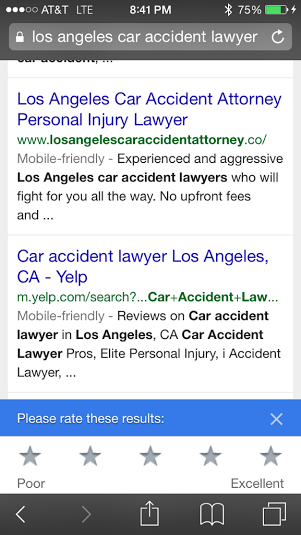 Have you seen the star rating in mobile search? Social Media Rankings #1 | How Can You Find Out Where Vines Are Embedded?